Rogue River—beautiful. Add art—magnificent. Add music and it becomes Art Along the Rogue. Like a skilled restoration painter, this event takes local natural beauty and enhances it with music and lots of chalk. 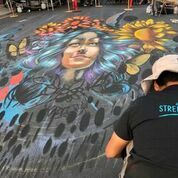 The madonnaras (street painters) will use a temporary medium to turn ordinary city streets into a bountiful visual buffet, and it is all free. There will be two blocks (plus another short street) of nature-themed masterpieces on display created by West Coast artists. This 16th annual event happens downtown Grants Pass between Fourth and Sixth streets with the main music stage on the corner of 5th and 8th. Forty individuals—novice to expert alike—participate in the “Wild & Scenic” art extravaganza with several featured painters such as Jaime Bryn, a local from Grants Pass, and Jolene Russel who will present a 3-D trompe-l’oeil sure to awe passersby. Long before the actual event, Bowen calls for proposals and asks artists to submit applications along with the proposed art-piece. Then these submissions are juried, and certain entrants are invited to participate. With an Octoberfest like feel, there will be a beer garden highlighting local Grants Pass breweries. Ale and art—all outside—not too shabby. And while the artists create, the musicians play. The musical lineup kicks off on Friday evening at 5:30 pm with the The John Dough Boys followed by headliner band Zepdrix (expect a Led Zeppelin and Jimi Hendrix mash-up). But that is only the beginning. There are many acts on Saturday and Sunday to round out a bountiful weekend of food, art, and vendors. So, why not partake in all of it? How often do people get to see artists down on their hands and knees making creations that transform by the minute while being auditorily entertained and gustatorily satisfied? Not enough in Bowen’s opinion. He calls it a “fun, good-spirited event for people watching and interactive art-making” and recommends catching bands Adam Knight and The Brothers Reed too. In fact, for Morin, this event is one of the only appearances where she feels comfortable talking about her artwork. She is typically quite shy. But not every artist is driven by the fleeting nature of the work. Ever Galvez, another featured artist for the second year in a row, is excited about being colorful. Artists, musicians, vendors and attendees look forward to the artistic bonanza all year long. “Loved it. Great people. Great creativity. Worth the drive,” says Donita Hunter who attended last year. With ample parking, trees displaying lovely fall colors and a chance to interact with artists during the creative process, it sounds like an absolute winner for a weekend art immersion. Adults and children alike can saunter, stroll, ambulate, promenade or go for a leisurely jaunt seeing watching it all happen right in front of their eyes while supporting local talent at Art Along the Rogue.